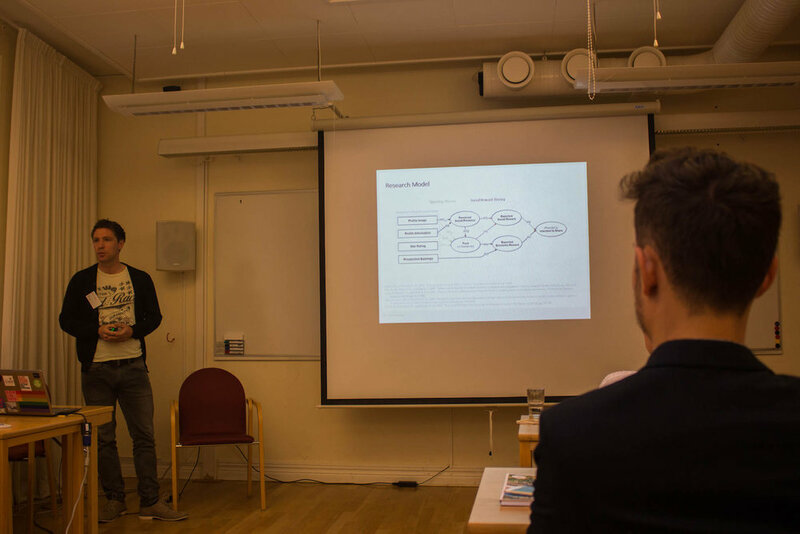 Last week I attended the 4th International Workshop on the Sharing Economy (4IWSE) in Lund, Sweden. Within this workshop, the scientific community researching in the field of the sharing economy presented conceptual, methodological and empirical questions of their current work. After having taken this great weekend trip, I want to share my experiences. Having successfully finished the my bachelor thesis in the field of the sharing economy, my advisor Florian Hawlitschek gave me the opportunity (thanks Flo!) to present the insights of my results at that workshop. We previously handed in an extended abstract that got submitted. It was an honour for me to hold a workshop session in front of the scientific audience. My presentation was about a phenomenon called "Sharewashing", which basically describes platforms that falsely and misleadingly claim to be motivated the social and ecological principles of "sharing" rather than financial profits. In our work, we proposed a research model to explore the effects of sharewash and tested it based on empirical data. If you are interested, feel free to have a look at my thesis. Personally, the 4IWSE was a great and interesting experience for me. Two days filled with workshops, keynotes and panel discussions shedding light on different aspects of the sharing economy. It was very interesting to meet and talk to researchers and founders from different academic backgrounds. While the overall research topic was the same, their research differed by the perspective and methodological approach. My first dip in the academic world was quite good one. Even though after completing my undergrad/Bachelor and just starting my Master's degree, I am very keen to start working, a PhD seems also to be an interesting option, But I have still quite some time to think about it! Two full days of knowledge exchange on the sharing economy. I thought: "What could be better than complementing it by a real sharing economy experience?" Even though I've already used AirBnB and Uber, some people think they misrepresent the sharing economy. One reason is that these platforms' economic / profit-oriented motives are seen dominant compared to their social and ecological motives (that's the link back to "sharewash"). As Couchsurfing is a platform facilitating accommodation opportunities free of charge, the monetary aspects are less important. Needless to say that I could also save some bucks to spare my travel budget. I've already had an Couchsurfing account. Looking for a host in Lund, I found around 3600 potential hosts. I was quite lucky finding a host, because I just sent out 3 messages and got accepted. Arriving at Lund train station, my host Yob picked me up at the train station. He suggested a nice burger restaurant for dinner for me and my fellow researchers. Yob was a very nice and friendly host. I slept at a fancy air mattress in his room at a student accommodation. He showed me around a little bit in Lund during my free time and even lend me a public transport card. It was like having instantly a friend in a foreign town. It was a great experience, where experienced first-hand the socially motivated aspects of the sharing economy. And also for my presentation at the conference my experience with Couchsurfing made quite a cool introduction ;-).